Parts 1-4 of this series can be accessed here. This is Part 5. The art of abuse of regulatory powers crafted by Ramesh Abhishek were not just devious but dangerous for the growth and progress of India’s markets. He twisted and tweaked facts, misrepresented to the agencies, lost minutes of vital meetings, suppressed investigation reports of the enforcement agencies, etc. As one looks at the National Spot Exchange Limited (NSEL) episode, more and more of his murky deeds are coming to light and one such instance is discussed here. What is Section 27 of FCRA? Section 27 in the Forward Contracts (Regulation) Act (FCRA) of 1952, states that the Central Government may, by notification in the Official Gazette, exempt, subject to such conditions and in such circumstances and in such areas as may be specified in the notification, any contract or class of contracts from the operation of all or any of the provisions of this Act. 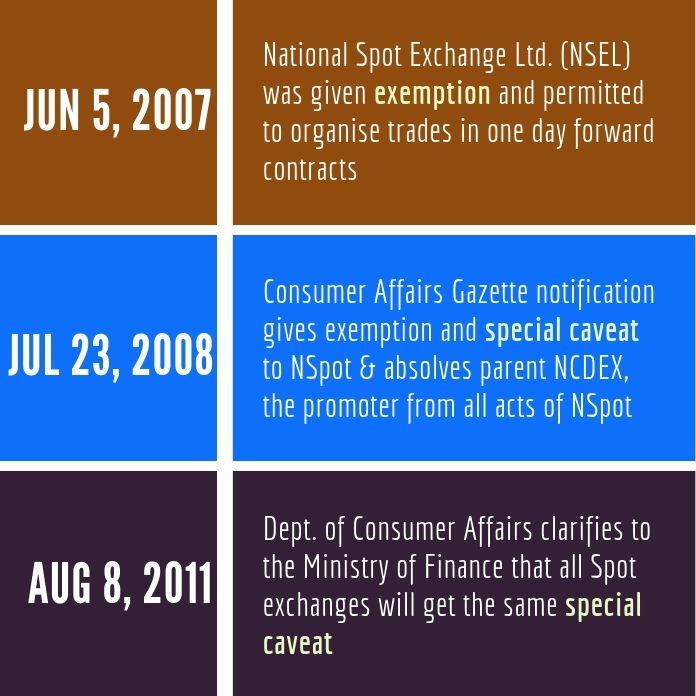 On Jun 5, 2007, the Consumer Affairs ministry issued a gazette notification in exercise of the power under sec 27 of FCRA giving NSEL specific exemption from organizing trades in one day forward contracts. Look at the benevolence of the Consumer Affairs ministry. When exemption was granted to NSpot, a special caveat was added, stating that the promoter namely NCDEX will not be liable for any omissions or commissions of NSpot. The parent, NCDEX was insulated from all acts of its subsidiary. “The National Commodities Derivatives Exchange NCDEX shall not take any responsibility for any act of omission or commission by the NCDEX Spot Exchange or share its infrastructure, software, or human resource, the two being separate and independent entities”. This demonstrates clear favouritism towards NSpot and NCDEX. 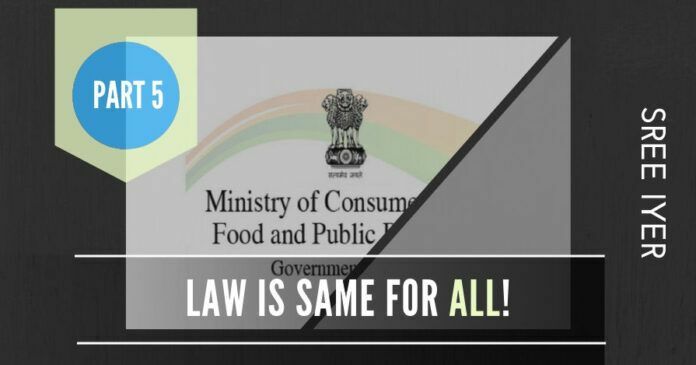 This special injunction, which was not there earlier in the exemption given to NSEL, was clarified later through a letter from Department of Consumer Affairs (DCA), to the Ministry of Finance (MoF) on August 8, 2011, which included all the spot exchanges into this caveat. For the timelines, refer to Figure 1. This was three years later. The above is another illustration of C-Company providing every handicap possible to the National Stock Exchange (NSE) group of companies in their battles against the Financial Technologies India Ltd. (FTIL) group. The question that comes up in this context is then on what basis did the Ramesh Abhishek recommend that FTIL was not fit and proper when clearly a directive was issued that the parent and subsidiary were two separate and independent entities and that the parent would not be responsible for any act of omission of the subsidiary? How then did he force FTIL to sell its business at fire sale prices, exit the exchange business completely (when it had conclusively proved to be a market leader, innovator and established India’s footprint on the global map of the exchange industry)? How did Ramesh Abhishek get away with going beyond his regulatory brief and recommending merger of NSEL with FTIL and supersession of the newly formed board of FTIL? The answer is simple – NSEL was a mere stick to beat FTIL (read Jignesh Shah) with, run his conglomerate into the ground because he was ruining the machinations of the C-Company at the NSE. The Rs,75,000-crore NSE co-location scam has still not been addressed and the perpetrators roam free, preaching morals as if it is business as usual. Next articlePakistani terrorist was not doing jihad, he only wanted to marry a Kashmiri girl? jaitley has to go, subrmaniam swamy must be in- clean up finance ministry, RBI and SEBI- MODI has to set the initial movement on all three at the sametime- not incremental – it is critical to expansion of India’s financial strength which impacts on her international political and military stature viewed by the immediate neighborhood and regional power structures. MODI decisive on air strikes- he has gained political, leadership and military capital- use it to power financial power. Modi walks with a swagger- that swagger can be expanded even more when he surge India’s broad financial strength through these vital channels. MODI- unprecented success through Mann Ke Bhaat- Franklin Roosovelt in 1930’s used the radio to reach out to create a movement and the new deal-he won four terms- the republican opposition at the time hated Roosovelt- like how the opposition in India today spew hate at MODI- Like Roosovelt MODI used that hate against the opposition. Opposition behind closed doors envy MODI- his charisma, accomplishments in short time with his leadership, his obsession to Mother India-deliver the farmer to unimaginable heights/aspirations and that drive has spilled over to the larger poor, lower middle, middle and upper middle classes-enabled 99% of India move foward like launch of CHANDRAYAN to reach spaces where we have never envisaged before- that is the power this movement can become.When Roosovelt passed on- it was writen- paraphrased- common man- I have not met him but he knew me. Common Indian-man,women and child- hope one day it would be said of MODI. Dear MR Sree Iyer, your website exposed PC, his son, NDTV and others. Posted many articles in this website with authentic documents to prove the above perssons guilt? Now suddenly everything stopped and you don’t even mention anything about the above persons. Surprised even SS is silent nowadays?! PGurus is just a thermometer, Mr. Madanagopal. We can tell that the patient has fever (i. e. is corrupt). It is up to the executive arm to prosecute the offenders to the fullest extent of the law. On every TV show on corruption, I have mentioned the lack of progress on this front, as far as the Modi government is concerned. Even the Bail gaadi narrative is all the effort of an individual that happens to be in the BJP and does not get any credit. This goes to show the shallowness of the party’s leadership. Can’t stomach the success of someone who has been deliberately kept out of the government – for what? Can Modi answer one simple question? After having come to power in 2014, riding on the shoulders of Dr. Swamy, is this how he “thanks” him? Every thinking reader should ask, why the entire polity of India is against Dr. Swamy assuming a ministerial position?